Come savor the sun and relax in the peaceful, quaint, family atmosphere of our shore oasis. 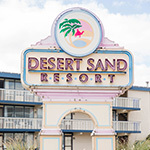 The Desert Sand is located only one block from the beach in Avalon, surrounded by the vast beauty of the Seven Mile Island and a diversity of attractions. Our motel offers quick and easy access to several beautiful sights and entertainment attractions. Located just one block from a beautiful beach, the Desert Sand motel resort is an affordable motel suitable for those looking for a one bedroom motel room, two bedroom hotel rooms, families, couples, or just someone looking to get away for the weekend or holiday to get some deserved rest and recuperation. We pride ourselves on keeping our resort of the highest quality, offering delicious food at our motel restaurant, and allowing our guests to have fun in our motel pools, including both outdoor swimming pools and an indoor heated swimming pool. We work to ensure that our motel rooms are kept as clean and tidy as possible for our guests, and at an affordable cost. Perfect for holidays or special events, we will ensure that our guests are kept as happy as possible during their stay. If you are interested in booking a motel room at The Desert Sand Resort, fill out our reservation form here, or if you have questions or require further information about our motel rooms and motel room deals, feel free to fill out our contact form here. Will open May 3rd for our 2019 season. Now taking reservations, please call or fill out our Reservation Request Form here. Office Hours: Tuesday & Wednesday 9AM-2PM.